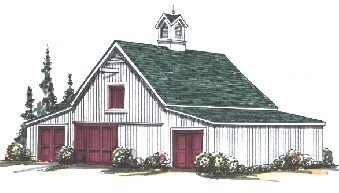 This barn-style garage has all the room that you need to pamper three cars, trucks or small boats. It has three 12'x24' parking bays and a big workshop or storage area. Pull-down stairs and a handy outside hatch lead to a 420 square foot loft for more storage. Floor Area: 1,056 Sq. Ft., Loft Area: 420 Sq. Ft., Ridge Height: 20'-4"